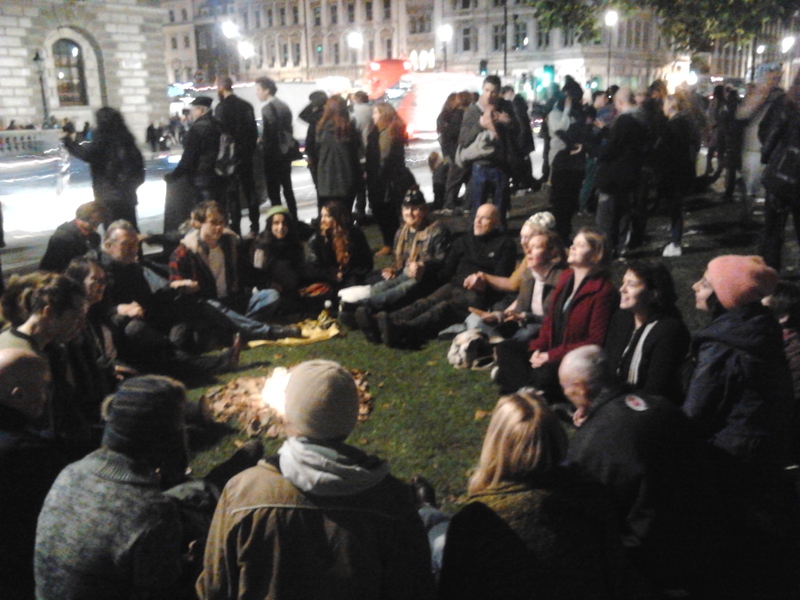 So here’s a brief run down of my visit to Occupy Democracy in Parliament Square on Saturday 25th October. It took me a while to find it, I was expecting it to be on the main patch of grass but this had been fenced off and was surrounded by police officers. Taxpayer funded police officers guarding a piece of grass around the clock at the behest of a private security firm employed by the government to police it, also at taxpayers expense. Officers from a police force that is itself facing the threat of job losses, service cuts and privatisation as a result of the current administration’s policies – all there to prevent a pro-democracy, anti-austerity protest outside parliament growing in numbers and actually forcing the issue… interesting! I found the camp on the far side confined to a small strip of grass next to the main square. 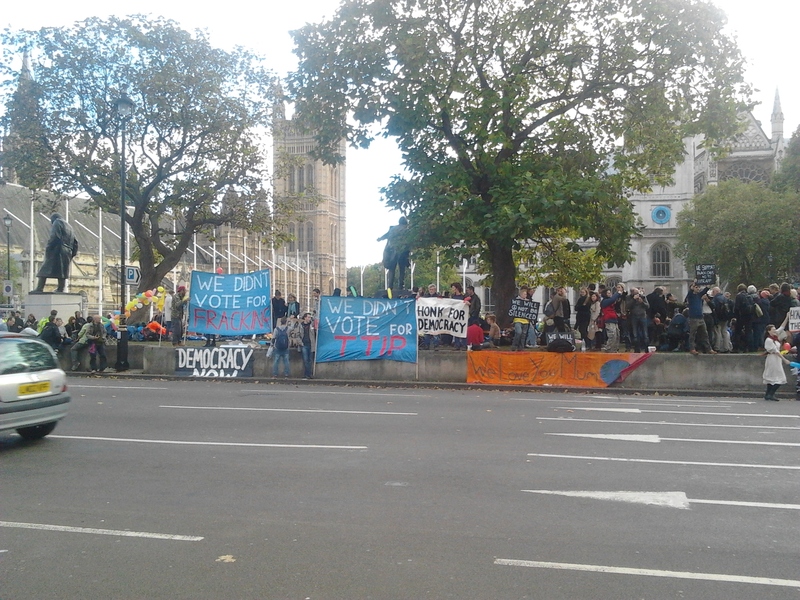 There was a good number of people in attendance, many holding up banners facing the road. Talks were happening but with no amplification (it was confiscated), so it was hard to hear what was being said at first. Especially as every couple of minutes a honk of support from a passing vehicle would trigger a cheer from the banner wavers. Every ambulance and fire engine was guaranteed a honk, a fair few cab drivers, coach drivers and random cars joined in as well. And, of course, there were the occasional heckles and uncalled for abuse from the less supportive, all met with love and tolerance from the camp. So I watched a couple of good talks and decided to chat to some people. I was almost immediately put off, as the first person I encountered was an old school Marxist calling for violent revolution and a ‘socialist dictatorship’ – apparently this is the ‘only way’ to bring about change… Happily, this guy was clearly in a minority of one so we agreed to disagree and parted ways. I didn’t see him again, I presume he eventually ducked out having repeatedly encountered the same message he received from me. After that, things got much better. I met lots of good people, all very well informed and very optimistic that change is coming and that social progress and democratic reform is possible. I spoke to many people about NOTA and handed out many flyers. Most people were very supportive and understood straight away the need for it. The only detractors were people who believed that withholding consent at elections is already possible (ballot spoiling, abstaining etc), I was able to explain the difference to most but not all. Including, unfortunately, one of the Occupy ‘generals’ (as they are probably unfairly sometimes referred to) but to be fair, he was clearly very tired and busy, not least of all from sharing on site baby minding duties with his other half… I later spoke to another ‘general’ who was much more receptive and keen to stay in touch, unequivocally agreeing with me that NOTA has to happen. To cap it all off, I also got to speak to Michael Meacher MP who you’ll be pleased to learn 100% supports NOTA and our efforts to get it on the ballot paper. I have his email address and will be following up to see if he can help us out in any way in the coming months. 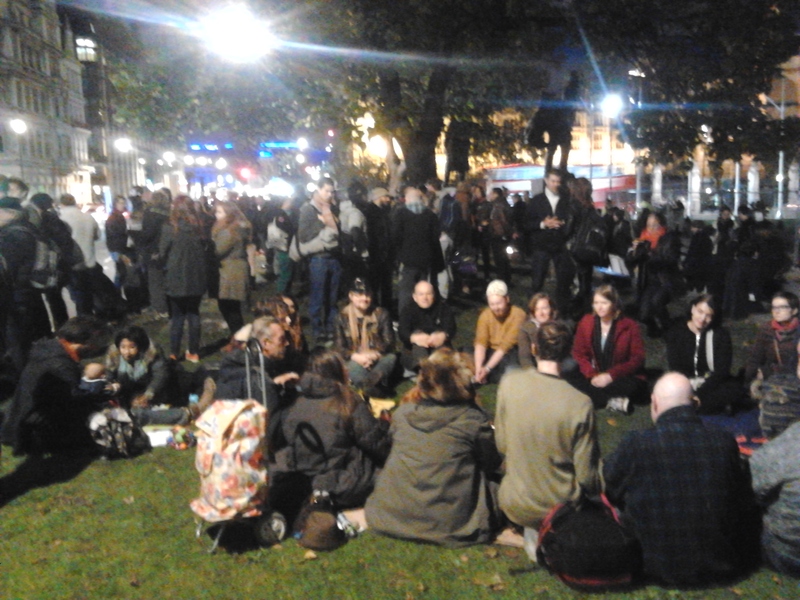 At one point, things were soured slightly by the arrival in the vicinity of stragglers from a nearby EDL march who had decided to come and try to start a fight with Occupy… presumably, they got bored with fighting each other. Happily, and rather ironically, the large police presence quickly leapt into action and bundled them away from the scene never to return. When I left to catch my train just after dark there were many more people in attendance than when I had arrived and also, ominously, many more police officers. All in all, a most enjoyable and positive experience not just for me but also, I hope, for the NOTA cause. A special mention and thank you to member Mark Hinchliffe for helping me to get there. Onwards & Upwards!